Defendants in high-profile theater embezzlement case repeatedly questioned by court | Russian Legal Information Agency (RAPSI). 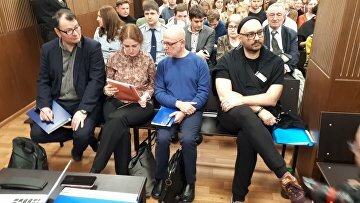 MOSCOW, March 21 (RAPSI) – Moscow’s Meshchansky District Court on Thursday repeatedly questioned defendants in a high-profile embezzlement case involving the Gogol Center theater director Kirill Serebrennikov, RAPSI reports from the courtroom. The questioning was conducted to finally determine a kind of a new examination to be carried out. The court had to interrogate the defendants because witness for the prosecution failed to appear in court. In January, ex-chief accountant of Seventh Studio stage company Nina Maslyayeva involved in the case confirmed cash out transactions while giving testimony in court. Maslyayeva said during interrogation that Seventh Studio managers initially expected that they could make money from Platforma project oriented to the promotion of art. Moreover, she stated that the stage company was meant to win a tender for the project realization with the assistance of then official of Russia’s Culture Ministry and current director of the Russian Academic Youth Theater Sophia Apfelbaum. Maslyayeva also testified that all defendants were cut in on and ordered her to cash in funds allocated by the state for the project. Other defendants in the case are ex-Seventh Studio head Yury Itin, ex-general producer Alexey Malobrodsky, ex-official of Russia’s Culture Ministry and current director of the Russian Academic Youth Theater Sophia Apfelbaum. Producer Yekaterina Voronova, has been put on the international wanted list and arrested in absentia as part of the case. According to investigation, the defendants have embezzled 133 million rubles ($2 million) of 214 million rubles ($3.2 million) allocated from the budget to Seventh Studio for promotion of Russian contemporary art. Investigators claim that Itin, Malobrodsky, and Maslyayeva were falsifying data for the Platforma project’s plans in 2011-2014 on the theater director’s request. This data was provided to the Ministry of Culture as the rationale for financing from the state budget. Apfelbaum, according to investigators, signed contracts on state grants in the amount of more than 214 million rubles with Serebrennikov’s stage company on behalf of the Russian Culture Ministry, and provided further agreement of received reporting documents, which contained overstated information on quantity and cost of the held events, thus abetting the embezzlement. Apfelbaum admitted that she controlled the movement of cash but denied involvement in the crime.